I keep getting surprised by the way I feel after a decent rest and a meal. Today I am in a much better shape than I thought I’ll be yesterday. Since Santarém is only about 17 km distant, I didn’t start too early. Heading off at 5:45 will be enough to get me there before noon. 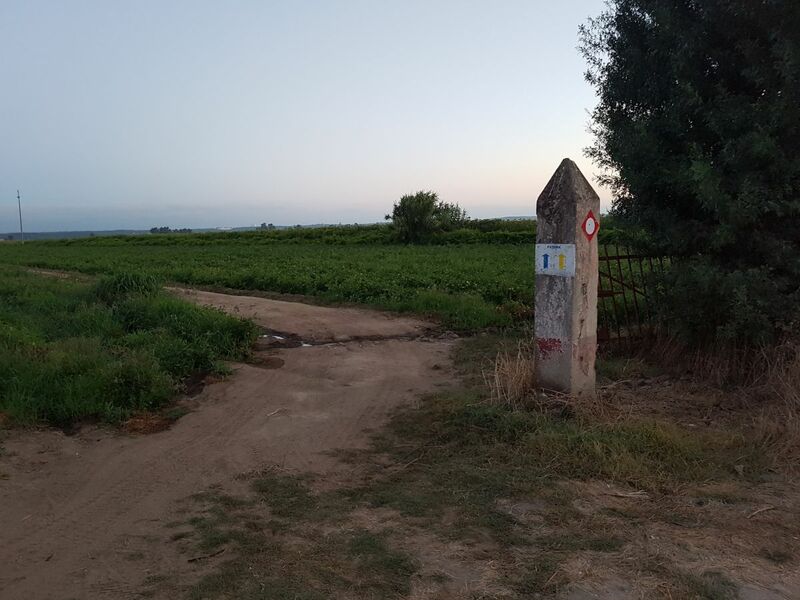 After Porto de Muge the Way follows the river bank to the right, through the tomato fields. Another lesson from the previous Camino that I had neglected to apply, is that walking is easier with the sound of music. With good songs the feet don’t feel as tired nor do you think how much further it is. If the music is very good than it can even provide an extra boost to your steps. That’s how… after what seemed like a short while… I came across a signpost saying ” Santarém hotel 1.4 km”. True … the last stretch is uphill … but not a very steep one. Arrived at Santarém at 9:45. Nice town … both the shopping area and an old town center. Nice hostel … spacious and with all the amenities a pilgrim might need … from hooks in the showers to small bed holders for recharging the smartphone. A standard routine is up next, shower and clothes washing. Since I’ve had enough of that “ordinary” detergent I’ve switched to soap … with marginally better results. During a short siesta break I’ve read a line from the speech Pope Francis gave at Krakow ” replace the comfort of the couch with walking shoes”. I can only add that comfort of the couch is much greater, after walking for a while. It’s time to grab a bite or two. The lady at the tourist info center nearby recommends a place. I get there, look for a menu … and rediscover that charming custom where lunch (and dinner) are only served at specific times. Needless to say… bad timing on my part. After a long walk around the town in search of a restaurant, I finally managed to find an open pizzeria. Back at the hostel I meet a new peregrino – Jorge from Spain. Jorge is a really good guy … exhausted after the longer stretch today since over the last 5 km he ran out of water. Jorge speaks Spanish, so its an effort to keep track of it all. As Jorge leaves stage left … Neno from Bulgaria comes in. Neno speaks English so I use my fake American English accent to explain that I am from Croatia. We keep on chatting and at one point he comments that I must be from South Croatia and not the North. It appears he mistook me for a Korean (and I hardly look like one). So I explain again … not Korea … Croatia … Hrvatska (original).. “why don’t you say Hrvatska man … instead of making me sweat it out in English”… he replies in Bulgarian. Why yes … Croatian and Bulgarian are somewhat similar… Slavic languages. “what Slavic … that’s 19th century Russian propaganda, we are all people of Thracian stock”. So anyway … I was treated to am interesting historical lecture on the good old days when the Bulgarian Empire stretched from Ural mountains to the Balkans. I head outside in search of the mass and at the square I encounter fellow Korean and the Lithuanian peregrinas together with a bunch of newly met folks. The square features a large church with the Door of Mercy… alas locked. The church of Misericórdia on another square is open. More people on a Sunday evening mass than I experienced in Spain, and less gold and glitter inside the church. Back at the hostel, new peregrinas, Alessandra and Rafaela from Torino, Italy and another Spanish guy from Galicia. This one is started from Lisbon today on a bike. Interesting note, he mentions that walking pilgrims greet him with “see you later” to which he replies “no you won’t”. This guy does about 100 km per day, and the walking pilgrims do … somewhat less than that. Italian peregrinas are detouring to Fatima and persuaded Jorge to do it as well. Jorge is not “muy religioso” but wants to see the shrine. Jorge is a a kind of good guy that wears his heart on his sleeve and I found it hard to believe that he works as a policeman. He is also interested in history, so we have a long discussion on topics ranging from Spanish Empire to Donald Trump. Though his rapid fire Spanish makes it challenging to keep up. That was day no. 4.